My 5 year old son, Liam, has recently started to become very independent. Independent and helpful, all at the same time. He delights in being able to fix a PB & J for lunch and a simple breakfast of cold cereal for not only himself but for his little brother as well. He's really taken to being a good older brother and it really is the sweetest thing. Besides the amazingly quick pace we seem to be going through the ingredients for said dishes, the only problem I can find with this new arrangement is the unwanted return of an old pet peeve I thought I had left behind the day I grew up and moved out of my parents' house. Now I know it's not as pressing as the state of our economy, global warming, or even the sad shape my fingernails are currently in, but for some reason this sight flashed me back to a time in my life I don't particularly like, but thought I'd long since moved past. Judging by the feverish and bounty-hunter-like manner in which I conducted my search for the escapee lid, I will now have to face the facts that I absolutely have not gotten over my past. To clarify, it's not as if I had some deranged experience with milk, a la Carrie at the prom. Milk was actually a huge source of comfort for me when I was young. As the oldest of six kids, we didn't have a lot in terms of junk food, and milk was like liquid gold. We were never allowed to out and out grab a glass of milk, we could only use it sparingly to accompany cereal or in cooking. Every now and again, when I would feel overwhelmed I would sneak to the kitchen and grab a glass and steal a cup or two of the cool, refreshing, calming milk and breathe easier while I felt it coat my throat and cool my overworked insides as it made its way down to my stomach. When I struck out on my own, I could scarcely afford to eat a sleeve of saltine crackers a day for my main meal, but I always made sure I had a gallon of milk. Complete with lid. So, as a youngster, my frustration with opening the fridge to find a milk carton looking like the one above, is that I would find my comfort food in the same situation I was trying to escape. The lid that was once there, meant to protect the precious milk content from foreign debris, was stripped away and the milk was left defenseless. It was now left open to any intruder that could change the way the milk tasted. Open to debris that could take the sweetness of the milk and turn it sour, rancid. The blighted milk would act as an emotional mirror and I would see myself, so young and sweet, littered and souring because my own protective lid had been ripped from me by an uncaring and selfish soul. I was left open to the elements to rot and sour. 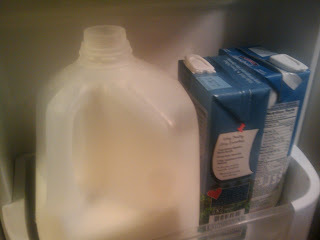 The capless milk would completely unnerve me and I would turn away from the fridge, saddened that the rest of the gallon --to me-- was ruined. As a newlywed I remember my husband losing the milk cap once. ONCE. Of course, back then I didn't give much time for introspection and I couldn't even articulate WHY I was so upset about it, but the riot act I read him so passionately over something so trivial must've surely scared the bejeezus out of him. I yelled at him as if it was personal attack against me, how's THAT for crazy? Anyhow, it must've scared him straight, because until this morning that sight had never greeted me at the fridge again. But today as I tracked down, sterilized and replaced the lid to the milk I was forced to delve into WHY I was so UNDONE by the missing milk cap. I couldn't very well light into my newly independent and helpful 5 year old the way I had my husband years before, that would be so cruel! It was wrong to do to an adult, let alone my baby boy. It was after a few breathers, some nervous laughter and a big sigh that I realized to what extent I had identified with Vitamin D, Whole. I know it hasn't solved anything or healed anything to have this realization, but it does feel like I'm moving in the right direction by identifying where my feelings are coming from. Ironically, since I've been pregnant with this child, I've become lactose intolerant. I wonder what THAT means? THAT IS AWESOME!! I loved this ENTRY!! LOOK at your talents of writing oozing out in this ENTERTAINING post about the missing milk lid!! I WILL NEVER look at milk lids the same, EVER AGAIN!! THE PHOTO IS AWESOME!! And I LOVE your new background and I love this song!! Trouble is a friend! :) and I LOVE YOU, SISTER!! Who would've thought that such deep introspection could be sparked by the temporary disappearance of such a mundane piece of plastic? It's not always easy to look deep inside when we are upset, but how productive it turned out to be for you! I'll remember that next time I throw a hissy fit over grammar or punctuation. And I don't even remember the riot act, so it's all good. Nice read, my dear , talented and lovely wife. TYPO ... LAST... SENTENCE... SPACE... BEFORE... COMMA... AKKK! haha...i remember getting in trouble for drinking milk like i did in south carolina!!! ahhahaha....loved the article sis, ur so talented =) love u! Milk really was like gold! It must have been a universal poor man's family rule. Lots of kids + not enough money = no milk for you! Lol. I loved reading your writing! You got me hooked. Looks like Bill is quite the writer himself. I think he should have his own blog. Anyway, I sure love you guys and am happy to find your blog! Makes me feel like I'm right there! Muah!